Bombay Sapphire’s Star of Bombay and Dry Martini, the new chic venue at the Melia White House Hotel have teamed up to offer a very special Valentine’s experience for gin lovers, and ordinary lovers. Available exclusively at Dry Martini at The Melia White House London from 12th – 14th February the romantic serve matches the beautiful spirit of Star of Bombay, the newly launched small-batch super premium gin from the Bombay Sapphire Distillery at Laverstoke Mill with a fabulous chocolate dessert. And they’ve very kindly given us the cocktail recipes for those who would like to try making them at home. 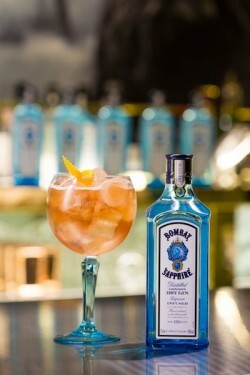 Created by Renaud de Bosredon, Bombay Sapphire Brand Ambassador it’s a unique alternative to the classic Gin & Tonic. A rich decadent serve, perfect for gin-lovers this Valentine’s Day. Pour all ingredients into a shaker except the cava. Add ice and shake vigorously Double strain into a chilled coupe glass previously decorated with chocolate on the rim Garnish with a rose petal and grapes. ‘Be My Valentine’ experience is available exclusively at Dry Martini at the Melia White House Hotel priced at £28 for two cocktails and a dessert.